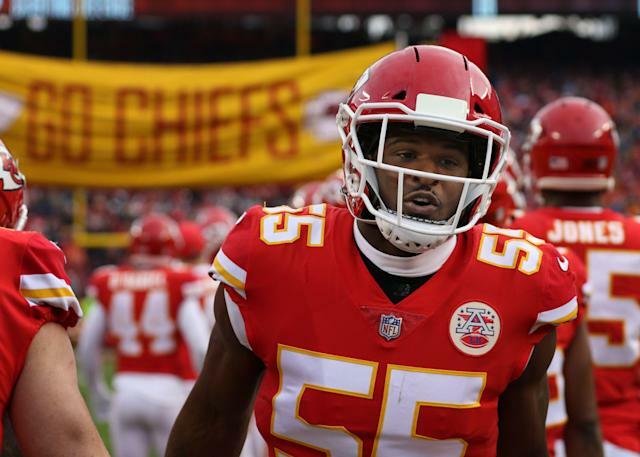 The Kansas City Chiefs have reached an agreement to send outside linebacker Dee Ford to the San Francisco 49ers for a second-round pick in the 2020 NFL draft, a source tells Yahoo Sports. The Chiefs recently placed the franchise tag on Ford, who emerged as one of the NFL’s best pass rushers in 2018. The deal also includes Ford’s agreement with the 49ers to a five-year deal worth $87.5 million, a source said. A first-round pick of the Chiefs in 2014, Ford finished tied for fifth in the NFL in quarterback hurries with 29 and tied for seventh in the league in sacks with 13. His breakout campaign came one year after an injury-riddled 2017 and two years after a breakout campaign in which he registered 10 sacks and 17 quarterback hurries. Ford, 28, was amenable to playing 2019 on the franchise tag, but Kansas City is shifting away from the 3-4 defensive scheme it used under former defensive coordinator Bob Sutton, who was fired at the end of the season after leading the NFL’s 31st-ranked defense. Steve Spagnuolo, Kansas City’s new defensive coordinator, will use the 4-3 scheme that is predicated on size and strength up front, and Ford — who is listed at 6-foot-2 and 243 pounds — isn’t necessarily a physical prototype for an edge rushing position in Spagnuolo’s system. That’s not much of a concern for San Francisco, which could use Ford’s pass-rushing prowess. The 49ers ranked 22nd in the NFL last season with 37 sacks. In return for Ford, the Chiefs will nab a pick that will give them four top 100 picks in the 2020 NFL draft. The Chiefs have already added a defensive playmaker to their secondary in 26-year-old Swiss army knife Tyrann Mathieu. They still have four top 100 picks in this year’s draft, which will allow them to either add multiple young players or move up to get an impact player to aid a defense that is in desperate need of reshaping.